With over 20 years of Broadcast Motion Design experience, Mark Rizzo has won numerous awards. 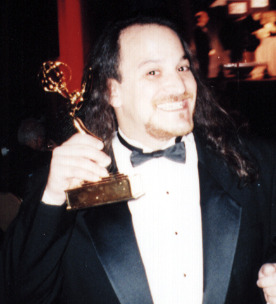 These include an Emmy Award for Individual Excellence in Graphic Design and Animation, two Telly Awards for his work with The Oprah Winfrey Show and multiple BDA Awards. You may have seen some of his Broadcast Design work on television shows like The Oprah Winfrey Show, The Steve Harvey Show, and on numerous Cable Channels including The History Channel, Discovery Channel, Comedy Central and HBO. Mark recently collaborated with Grammy Award Winner Richard Marx on several music videos and concert visuals for his current tour.